Hello beautiful friends! Does it feel like Spring in your neck of the woods yet? There’s a rumor that it’s going to reach 70 here tomorrow. It was 39 at the bus stop this morning so while I’m not holding my breath, I am hopeful Spring is on its way! It looks like it inside here already either way. If you’re new here, welcome! 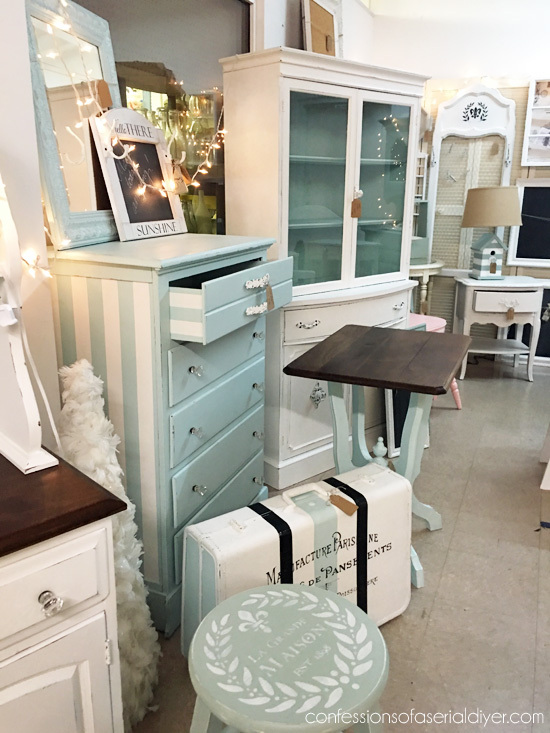 You will see I love to decorate with as little mula as possible, and that means lots of thrifting, repurposing, and upcycling around here! 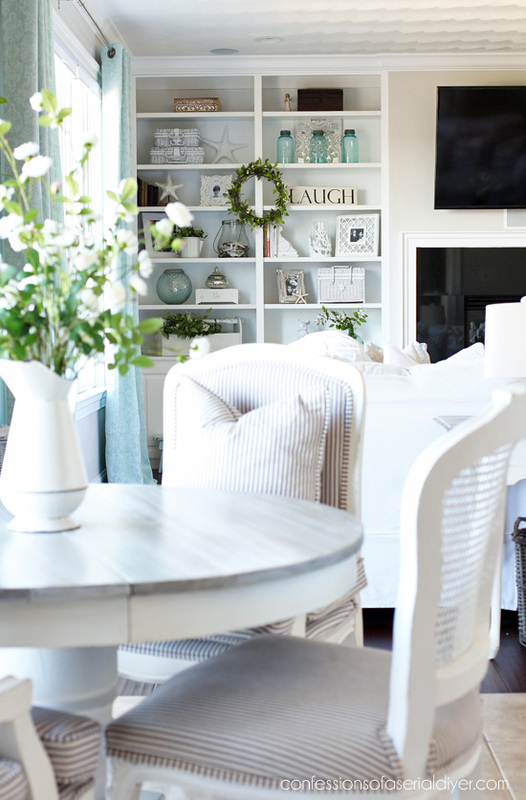 I last shared my living room at Christmas, and today I am sharing it all set for Spring as part of the Seasonal Simplicity Series hosted by my sweet friend, Krista from The Happy Housie. 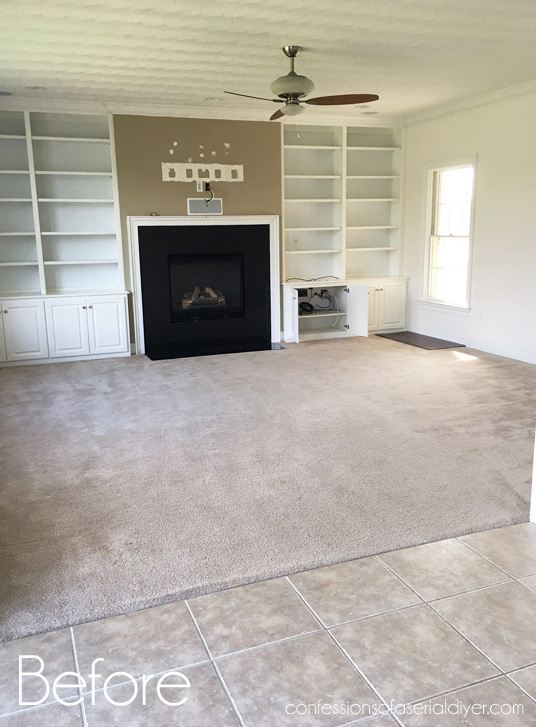 Can we take a minute to remember what this space looked like before we moved in back in August? I was a bit overwhelmed with how I was going to make this space ours, but it didn’t take too long. As you might remember, I had a tough time when I was looking for a new dining set for my kitchen. I tried to buy new, really I did. 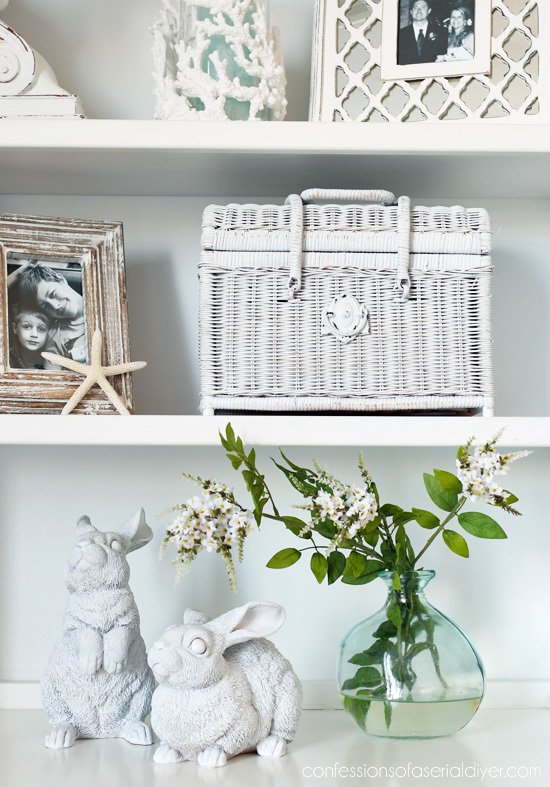 A simple vase of flowers says Spring in this space. 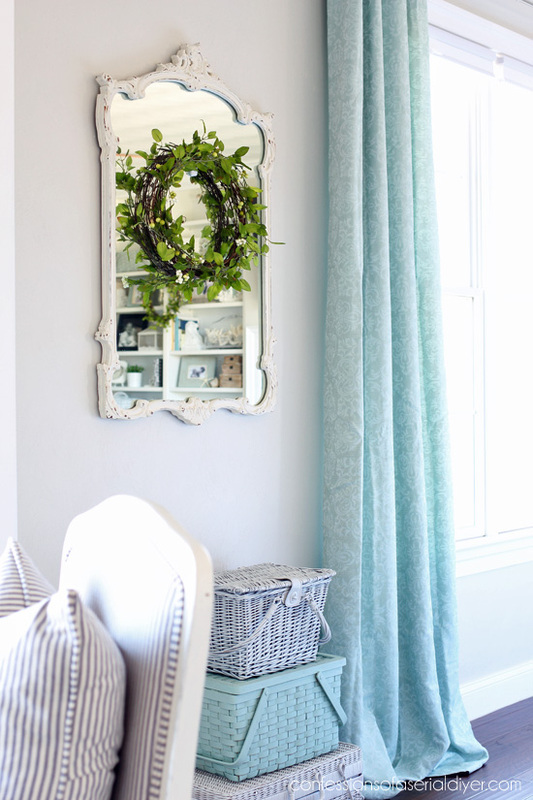 The one thing that can transform any space to feel more like Spring is greenery. A few touches here and there go a long way. Does this fabric look familiar? It’s the same fabric I used to line the drawers of this hutch I shared on Thursday, with fabric leftover from that Target shower curtain I scored for $3 at the thrift store! That curtain got a lot of mileage! See what else I did with it HERE…my favorite of the three! 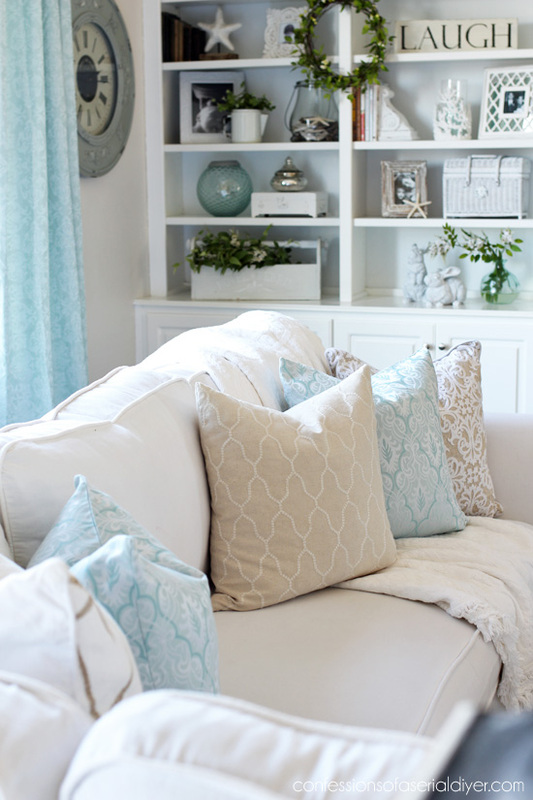 The blue and tans keep it light and airy against my white slip-covered sectional. 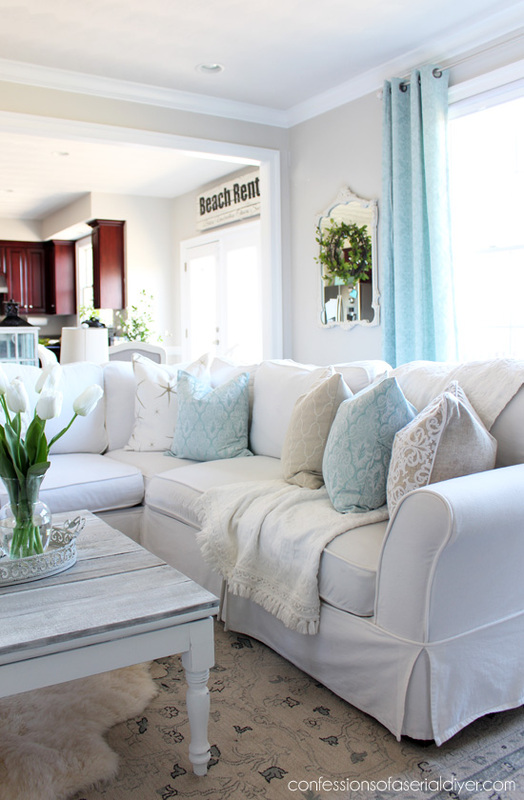 (Find my step-by-step sectional slip-cover tutorial HERE!) 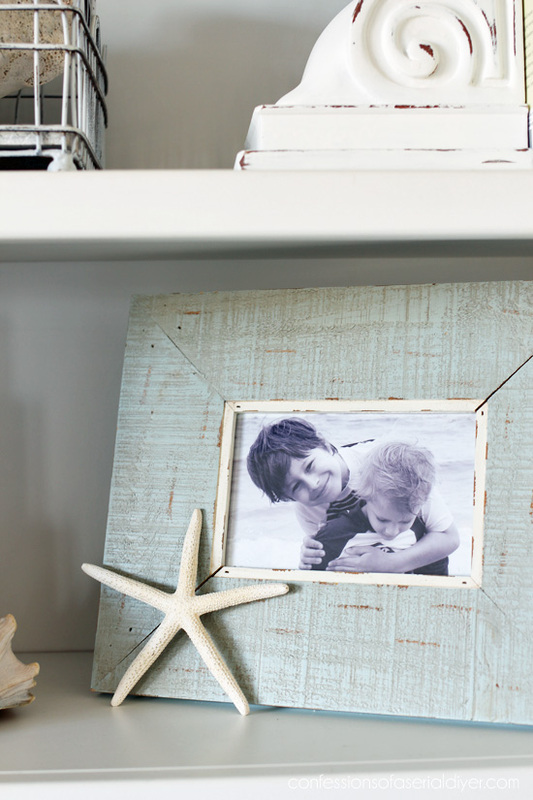 Pay no attention to those dark cabinets in the background…they are on my to-do list! Feel free to check out that Beach Rentals sign I made from an old fence panel HERE though. This was part of a trio of yard sale picnic baskets I painted and embellished a bit HERE. 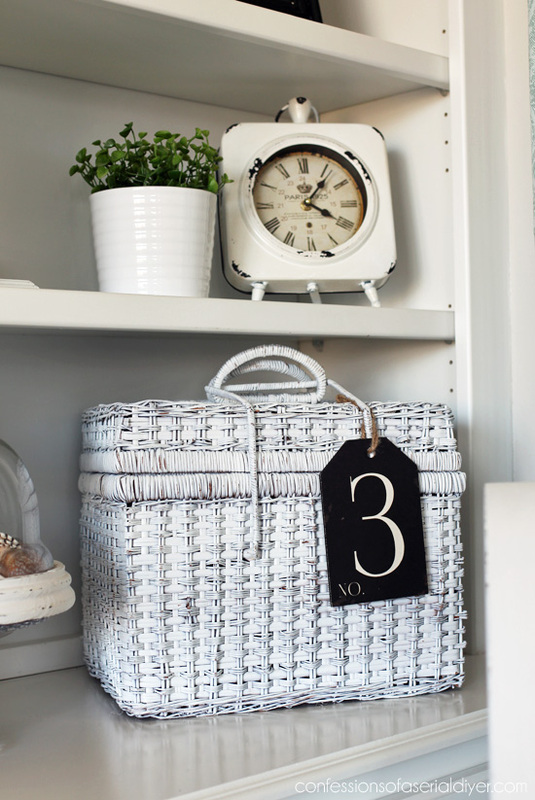 Baskets make great fillers for bookcases and add hidden storage as well. Now that’s a good friend! 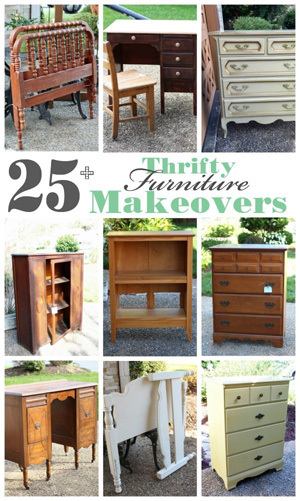 🙂 See these and 15 more mini-makeovers HERE. 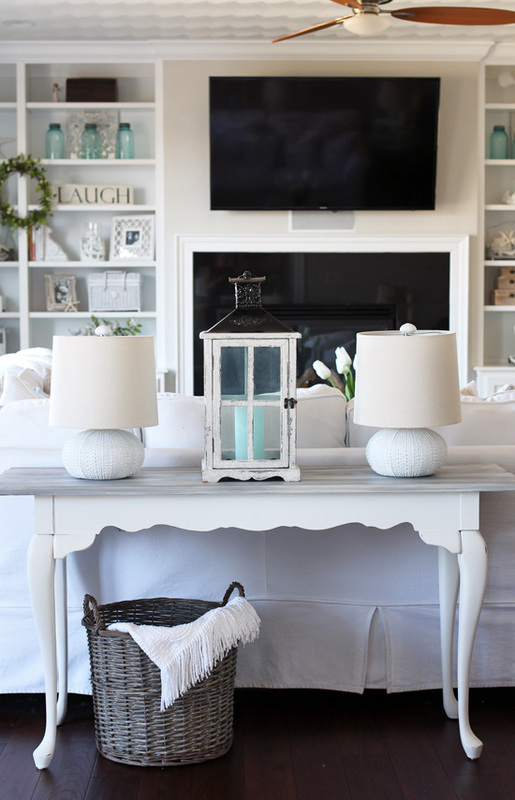 Revisit my coffee table makeover HERE. I used a curtain panel from HomeGoods to upholster it. See that makeover HERE. 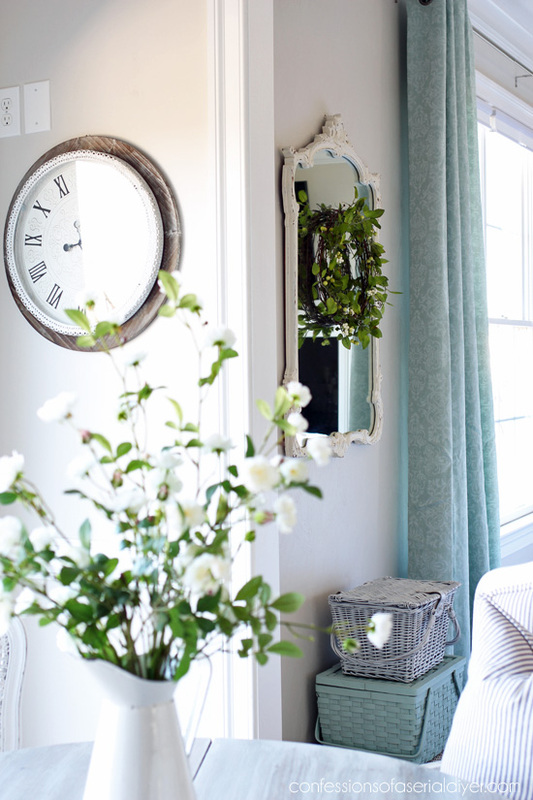 I had been searching for something I could repurpose or upcycle, but I found these mirrored pieces at HomeGoods and love them for some interest on this side of the room. I also love that they reflect the light from our big window on the opposite side. I hope you enjoyed the tour! 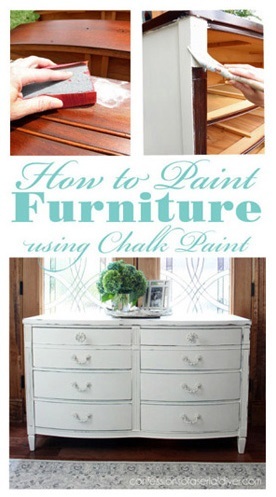 Thank you to Krista for hosting this fun Spring blog hop. The next stop on the tour is Lori from Designthusiam. Visit her HERE! 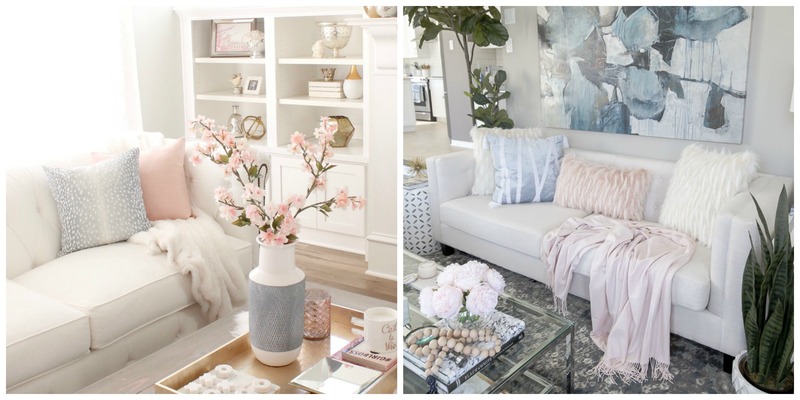 And there is a lot more Spring decorating inspiration below! 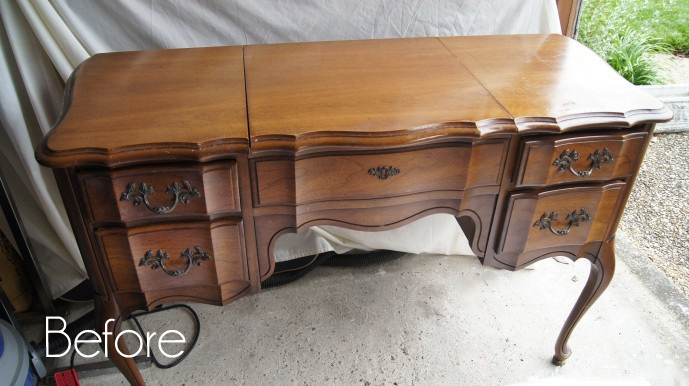 UPDATE: See how this pretty dressing table looks now HERE! Just beautiful – love everything! My favorite blue color also. 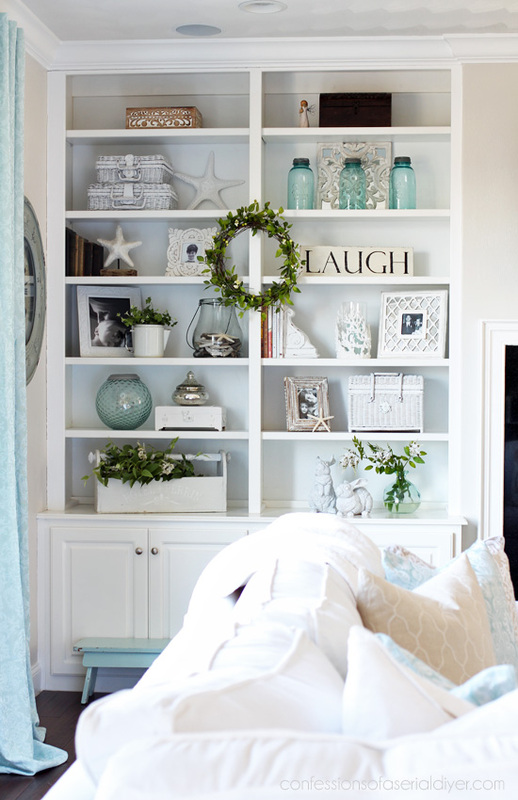 Love, love the curtains for that pop of color – where did you find those?? 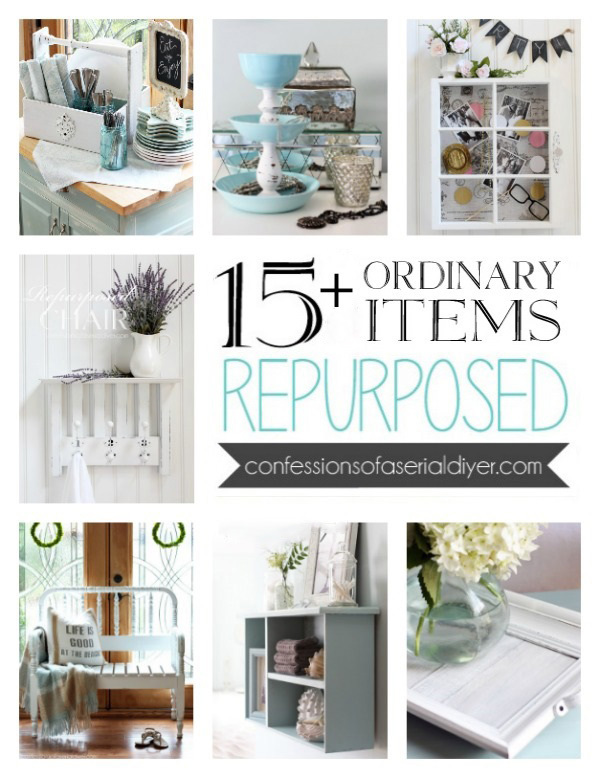 LOVE reading your blog posts!!! Best regards from Austria! Just Beautiful!! I wish my living room looked like yours. It is stunning! Thanks for sharing such great inspiration!! 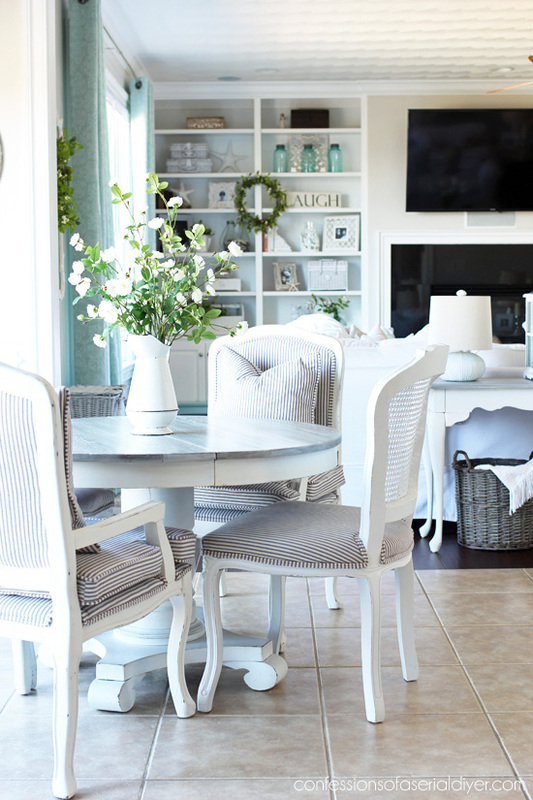 Your light and airy home is perfect for the spring season! Every angle is so pretty! It is beautiful, Christy. So many accomplishments in one room. 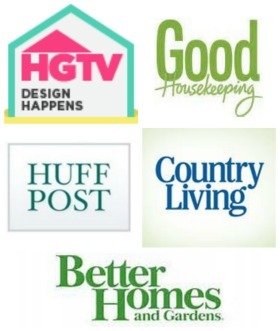 You truly are a “home maker”. Christy, Your home is beeeutiful!!! I LOVE your style! I never miss a post, but for some reason your blog posts ‘jump around’ on my computer…like something is running in the background and I can’t figure out how to stop it. Do others have this same issue? I am computer challenged 🙁 for sure. 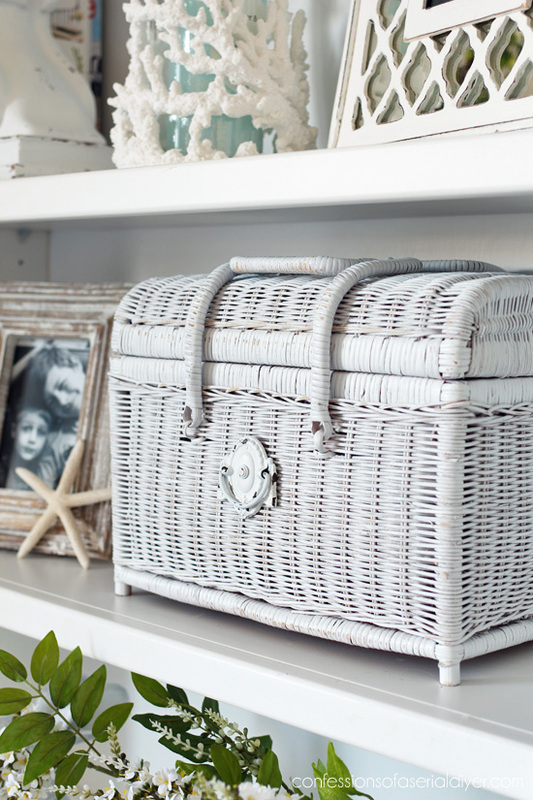 Anyway, your living room looks great and I love how pretty all those baskets look painted, so sweet. Aww thank you, Vicki! I’m so sorry you’re having trouble…are you viewing on a desktop or mobile device? Gorgeous tour, friend! 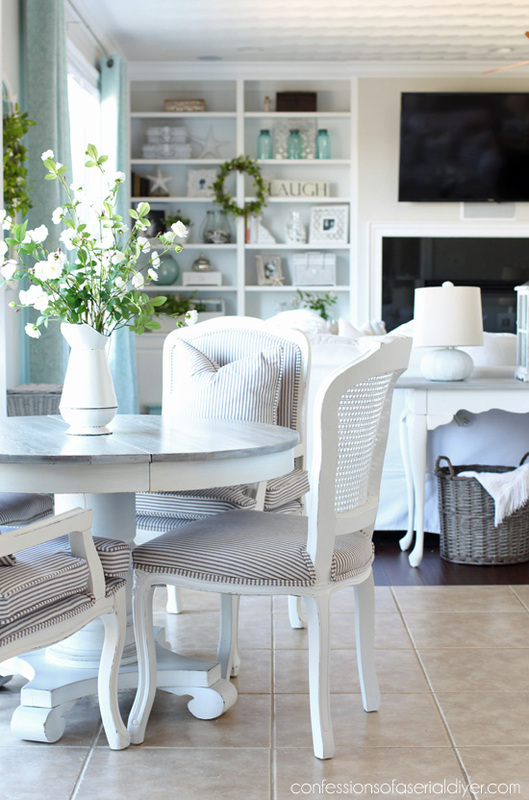 I absolutely love all the light and airy neutrals mixed with your pops of blue! My favourite combo:) So glad you could be on this tour! Christy, this is so beautiful! 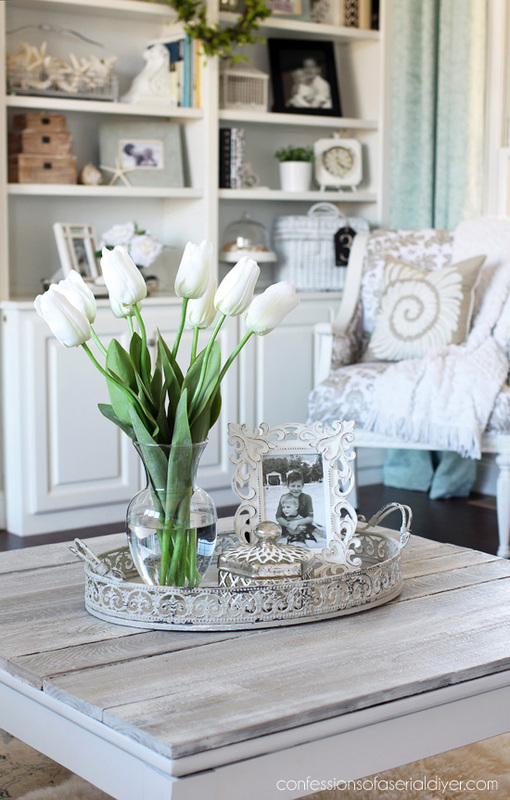 I love your home and it’s perfectly decorated for spring! I love your eating area with those ticking chairs! I just love you and your blog! Thanks for sharing it with me! Where did you get those kitchen chairs? The fabric is beautiful! Did you buy them like that or cover them yourself? WOW… How gorgeous … all dressed up for Spring!!! 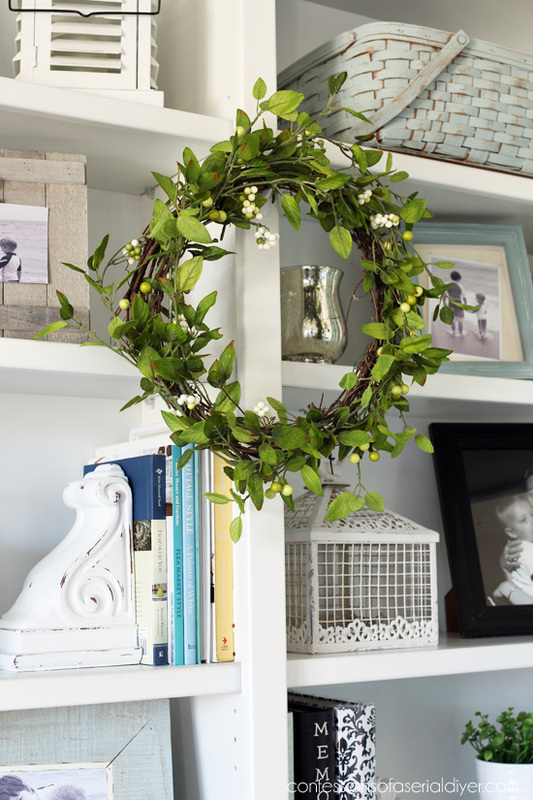 I love those wreaths that you made !!!! 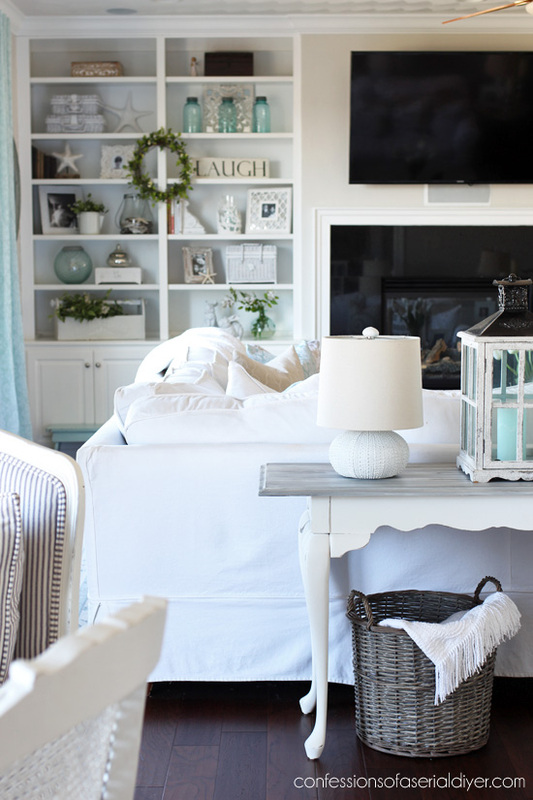 I love the soothing color scheme and all the little well thought out details! Beautiful! Christy , OMG I love how everything looks (purely perfection) it’s bright and warm, it says come in relax want some tea? LOVE the tour! It’s gorgeous my talented friend😍. There’s a little jewelry box on one of the built in shelves. 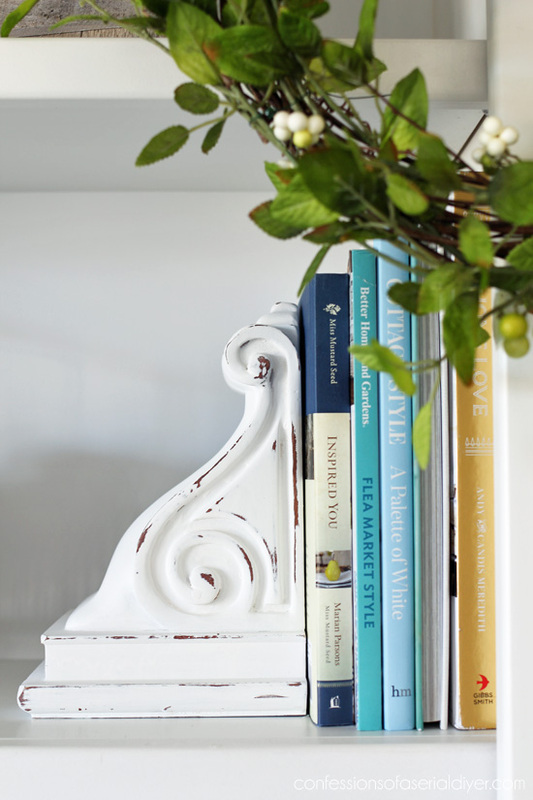 Did you paint the whole piece white with no distressing? I can’t remember you sharing that little box. It’s cute! 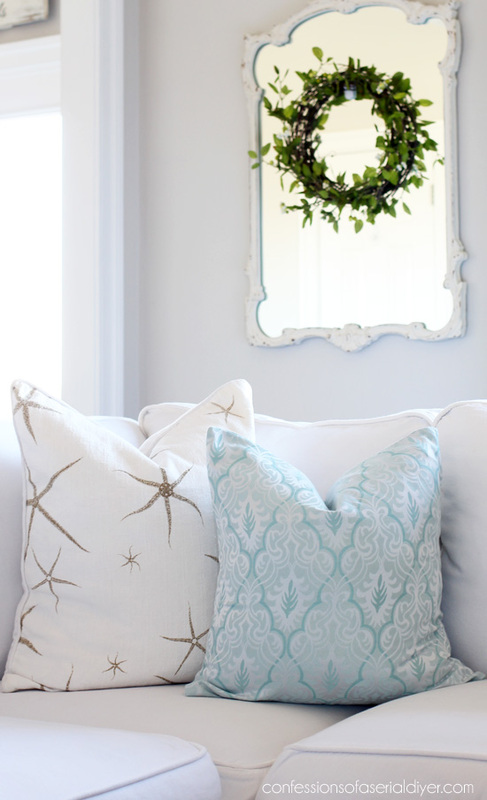 Your teal and white is beautiful and refreshing! That color scheme is my eye candy. Great accessorizing too. Thank you. May you enjoy your beautiful home in good health and peace for many years to come. Love the tour, Christy! When I get some things done in my house that were put on hold while I was working I will have a tour. Lots of ideas, just didn’t have lots of time! You did give me some ideas for decorating my hutch, though and your hubby can’t complain since it looks like you used lot of your funds to furnish your beautiful home!. Hi Christy, your home is beautiful and I am obsessed with your kitchen table and chairs. I love them! So beautiful! Thank you for the fun tour and always great ideas. Btw, my favorite color is white😉. 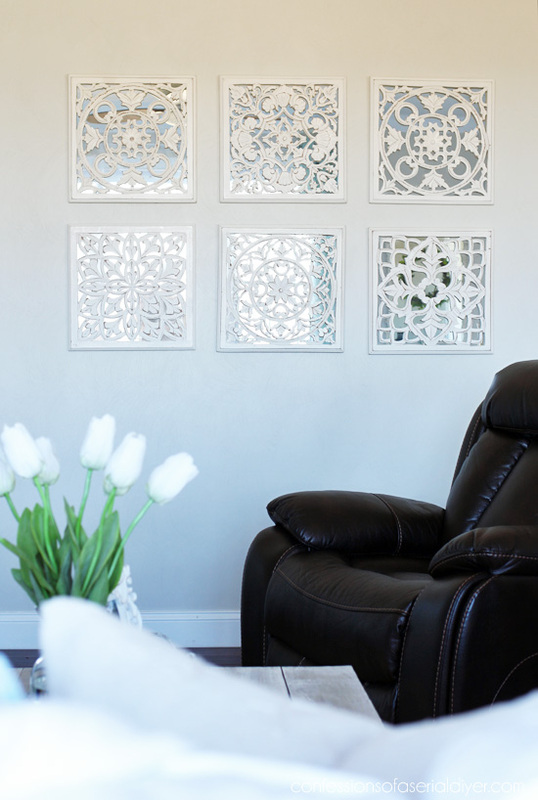 Your space is DREAMY! I love it! What a transformation. The hues and tones are gorgeous. Thank you for sharing! 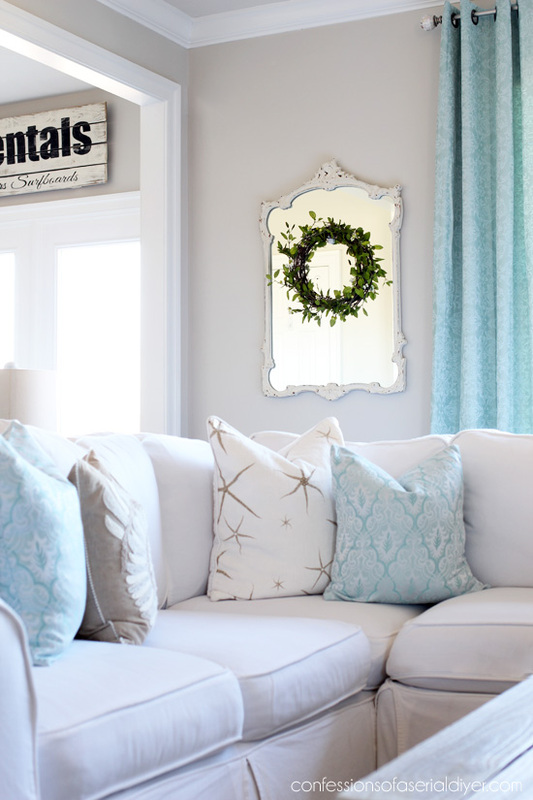 Hi Christy, I love everything about your home, the style, the colors, everything! 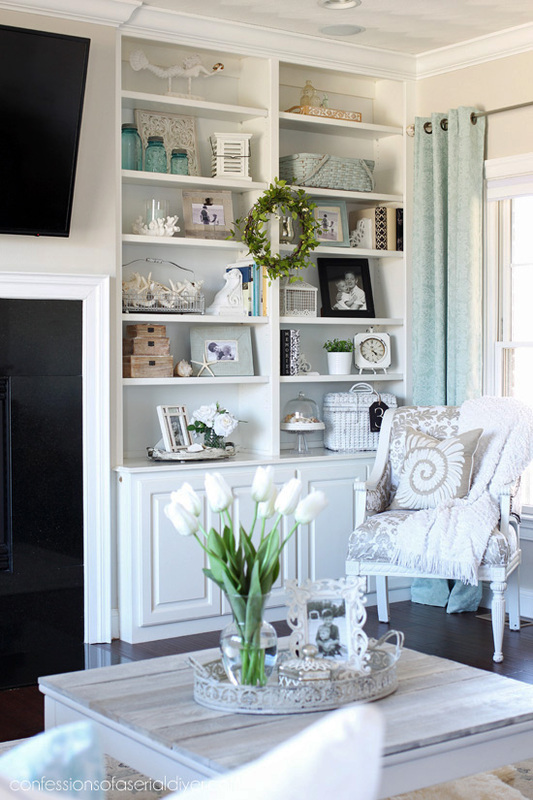 I am wondering about a particular blue basket on your shelves to the right of the tv on the 2nd shelf. Wondering the paint color and how you achieved the time worn look of it. I follow you faithfully and love all of your makeovers. 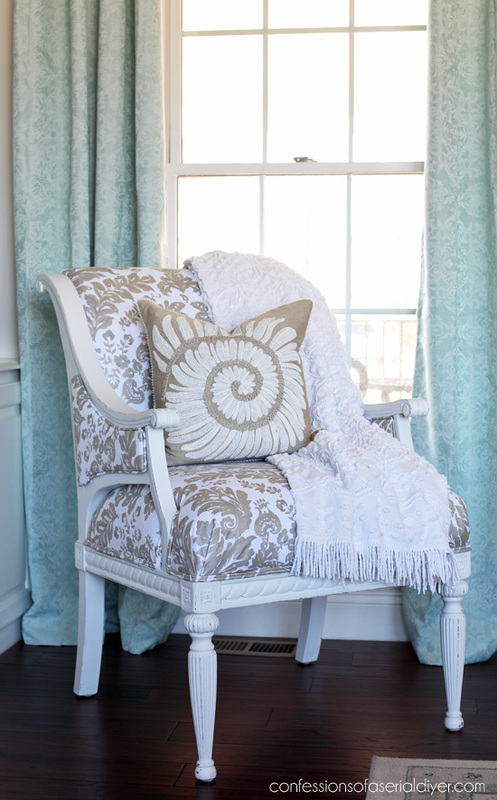 …the color looks similar to a pale blue bench by your sofa. 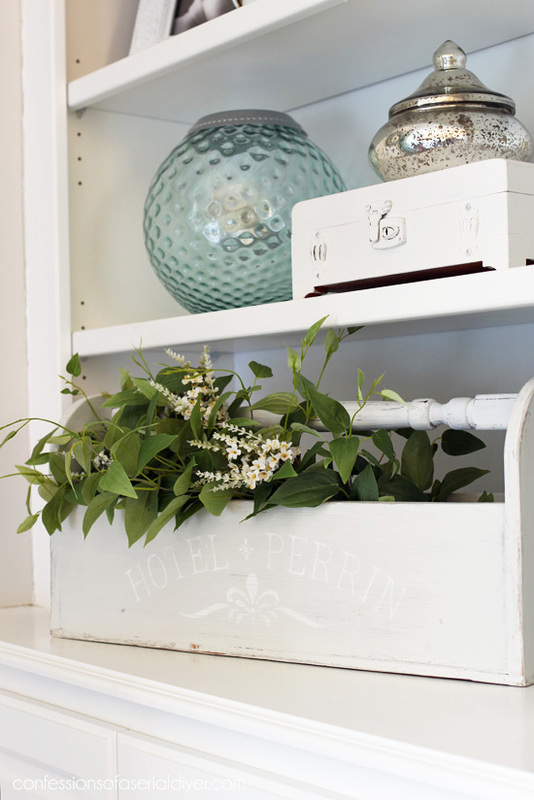 Would love to know the color and if you did a post on how to achieve that look on baskets. Thx so much for sharing your time and talents. Thx Christy, a Longaberger for $6! That is similar to the Longaberger I want to paint..